NOTE: To keep the contest up top so folks can find it, I changed the date to the "due date." New posts will be found below, so just scroll on down. 1. Tell me a zombie joke in the comments section. Puns also work. Heck, for this, I'll even accept links to funny zombie videos or other media. All it has to be is zombie and funny. The winner will be my favorite zombie humor. 2. Anyone can enter, except Wen, who won last time. 3. Post your joke by 7am EST on August 30, 2010. I'll read through all the comments and choose a winner some time that day. EDIT: Rule #4: One joke/entry per person, please. Last joke contest I had folks email them directly, but this time I'm making them public so those who have the same joke can try a different one. (And so that everyone can enjoy) On the off chance that you have an off-color entry, you can email me at blogquestions (at) yahoo (dot) com. Two zombies walk into a bar and... um, wow. I got nothin'. I'm drawing a complete blank here. ditto on the cover. I love the cityscape detail especially! You've probably seen this already because everyone loved it, but it's the only thing I could think of off the top of my head, and it's worth watching again. Here is Jonathan Coulton's song, Re: Your Brains. oh, love the cover! I'm so excited to read the next book!!! If only I knew a zombie joke so I could be entered to win the ARC!! Bummer! ...No, they eat the fingers separately. I just wanted to say I'm halfway through my ARC (got slowed down by dislocating both shoulders at once and taking meds that made reading a lot more hilarious than it should be), and I am loving it! Enter, people, you won't regret it! 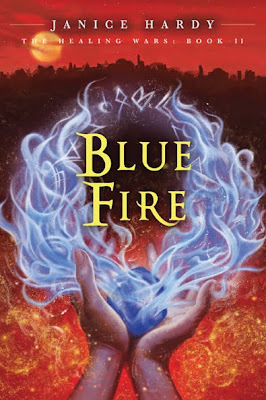 That's very interesting about ARCs and revisions -- I had no idea! What's red and white on the outside but gray and white on the inside? Campbell's Cream of Zombie Soup! Disclaimer: I'm not suggesting this out of hatred of the original work. I like Galaxy Quest, too, and I'm something of a Trekkie. This is off the top of my head and totally bad. A zombie walks into a bar, sits down at the counter, and asks the bartender for a Bloody Mary. The bartenders says, "I'm sorry, we're all out. you should have come an hour ago. But we do have taquilla." The zombie starts to freak out. "You can't serve Taquilla to a zombie! That's an abomination!" The zombie was getting so upset that the stitching along its neck was starting to come loose. "Geeze mister!" Said the bartender, disgustedly pointing to the creature's neck. "It's just a drink! Don't completely loose your head!" Well I had to look one up does that count. "3 zombies were walkin down the road one says hey look a zomie and the other one say thats no zombie thats my MOTHER!!!!" He's dead on his feet. What did the zombie get a medal for? What's a zombie say when he gets a letter from his girlfriend? "What kind of underwear and socks do zombies wear? Thanks all, I'm thrilled with the covers. Brandon Dorman does them and he's fantastic. Wen, glad you're enjoying it! Okay then...just count the first one. Why did the zombie lose his lawsuit? Okay, I made this joke up myself, even tho it seems like a no-brainer (hee hee). I have never made up a joke before, so prepare to be underwhelmed. Why did the zombie ask the professor to lunch? He wanted to pick his brain. These zombie jokes are cracking me up! 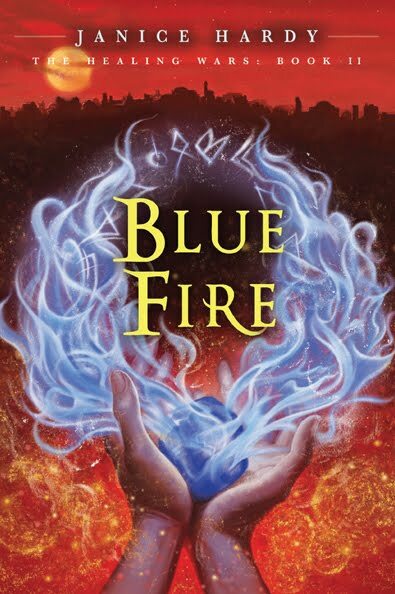 I got an ARC of Blue Fire when I went to ALA - giving it away when you come tell your Story Secrets at my blog, Janice! Zach Zombie says to Zelda Zombie, "That guy has a terrible mind." Such great jokes. Going to be hard to choose! Muahahaaa...couldn't help myself. Is there anything better than a zombie poem? I've got nothing, but this is lots of fun to watch! Two zombies walk into a bar on Capitol Hill. The first one sits down and says to the barkeep, "Brains, please." (Because even zombies ought to be polite). The barkeep looks at him and says, "You're not from around here, are you?" The barkeep serves him a White Russian, who manages to say, "For the love of Trotsky!" before the first zombie starts gnawing on its leg. The second zombie says, "I'll have what he's having," and slaps his money down on the bar so hard that the end of his index finger flies off. The bartender looks at it lying on the bar and the zombie says, "It's okay, you can keep the tip."